The Moon-Pluto mundane-square is the weak link here, and this weakness is why we don't see multiple concurrent violent events as we do when the aspects are stronger. As we will tomorrow when the Moon reaches a trine with Pluto and the other aspects remain in place. I hope I'm wrong, but I think tomorrow could be bloody. 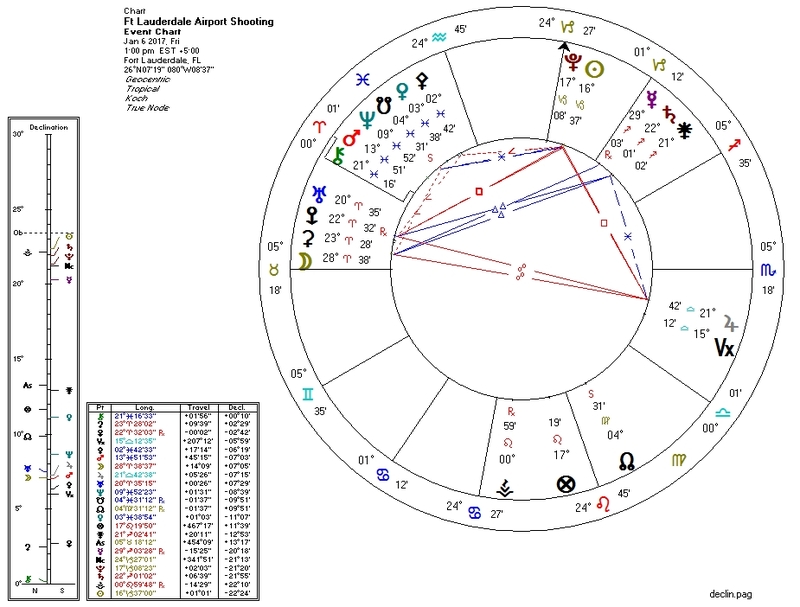 Against the chart of suspected shooter Esteban Santiago, transiting Pluto is sesquiquadrate the natal Sun (ruler of Pallas) and squine (105 degree) to the solar arc Pallas. We normally get a clear Pluto to Pallas transit on the charts of shooters -- this somewhat fits the bill but isn't the usual slam-dunk.